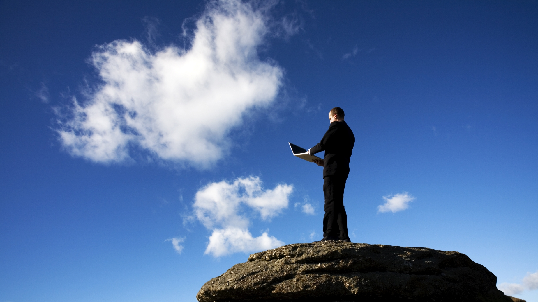 Is Cloud Computing The Right Choice For Your Company? It’s hard to enter into any elevator or read any tech journal without coming across some mention of cloud computing. While 16% of businesses were early adopters of cloud technology, it’s estimated that 35% of executives will transform their business models to include cloud computing by 2015, according to IBM research. Essentially, “The Cloud” is just a techie term for the internet. Cloud computing, then, entails renting server time from Microsoft, Amazon or Google and managing virtual databases, while paying for any processing and storage used. Executives may choose this business model over the traditional method of buying, installing and managing in-house server systems to run their company applications. Big tech companies themselves–like Microsoft, Amazon and Salesforce.com–have wholeheartedly embraced the cloud, which has analysts speculating that this is the way of the future. People like cloud computing because they can scale up or down, as needed. For instance, some businesses may see peaks in website traffic during certain hours, where running off 10 servers may be beneficial; yet, during slower hours, they can scale back to two servers. Most cloud providers operate on a month-to-month basis, so it seems pointless to be locked into a long-term contract when one can rent 50 servers for an hour or cancel a server at anytime. Business owners can move and locate their clouds anywhere in the world, switch data centers without calling a technician to set up the whole network again, and work on the same project from multiple cities at the same time. Businesses can save a ton of money with cloud computing because they don’t have to pay for hardware like servers, computer networks and core processors. Maximum performance is not needed 24 hours a day, seven days a week, 52 weeks a year. With the cloud, businesses only pay for the memory, space and support they need and use. It’s also cheaper to license software to run in the cloud (rather than outright buy it) and cheaper for insurance, since there is no hardware for thieves to steal. Workers can hop onboard the company’s system or collaborate on a project from home. Companies can find competitive talent, without geographical or physical limitations. They have a better ability to grow, contract and outsource work. Employee productivity often improves when they are given greater freedom over how they run their lives week to week. With the ability to access documents, files and memos from anywhere they can jump on the internet, the cloud spares employees the hassle of having to email others back and forth all the time or go through the trouble of zipping large files into condensed packages for sharing. Whether it’s a power outage, a problem with overheating, or a natural disaster, all files and projects are stored in a remote location that can be accessed in the event of a disaster. According to Windstream Business Hosting Solutions, it costs companies $84,000 for every hour of downtime, which adds up to $3.9 million over the course of a year for one-third of all companies! Furthermore, a Forrester/DRJ survey found that the average recovery time following a disaster was 18.5 hours, up from 17 hours in 2007. By contrast, cloud computing disaster recovery plans have businesses on multiple servers to recover data instantaneously should a situation arise. While there is no need to call in a technician to set up a physical data center, there is no shortage of people outside the company to deal with. Business consultants and cloud server managers will be responsible for keeping up servers, creating patches and upgrades, and powering the business. It also scares some people to think that their whole system could go down if the internet service is not working for whatever reason, but so far cloud services have demonstrated wonderful reliability and it’s possible to enable offline mode in advance to circumvent this sort of dilemma. With cloud computing, it’s now possible for companies to exist in several different locations at the same time. Coworkers can collaborate on projects, without ever physically meeting one another. Even though information is seen as extremely secure on the cloud (even the CIA uses it), there are some businesses with sensitive data that can’t get over their worries or fears with entrusting certain information to a third party outside the company. It becomes more difficult to ensure that all information is encrypted and not accessed by unauthorized parties. What if a company doesn’t like their service and wants to transfer to another cloud provider? Or, worse yet, what if a company’s cloud provider goes out of business? There is no easy answer to this question and the process can be a bit of a headache. There are many scenarios where cloud computing makes the most sensible option. For instance, tech startups will find that it’s easier to handle large demand increases and scale up quickly. For instance, Gad Barnea, CEO of travel startup FlyMiwok, found that he would only pay $28,000 per year to run his site in the cloud, versus the $250,000+ it would cost to create an in-house data center with 10 servers to handle peak demand. It also makes sense for companies with occasional big data churning projects to pay $200,000 for cloud computing, rather than spend $1 million on expanding their data centers. This was the case for TC3 Health when they were asked to comb through 20 million insurance company claims. It was much faster and easier to collaborate remotely through the cloud, rather than have new staff members cluttering the office. Also, for seasonal businesses, it makes sense to use the cloud, as it’s quick and easy to get set up and put services on hold when necessary, only paying as they go. Companies that sell Valentine’s and Easter chocolates, for example, might choose this business model.